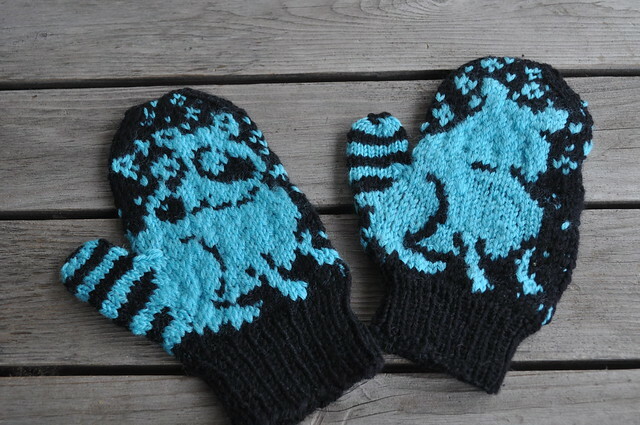 Notes: I started this pair of mittens in December 2010 right after I knit Elwood. I had big tension problems with Elwood. The floats are, in places, ridiculously long. I trapped when floats were more than six stitches. With Ringo I decided to knit them in the Armenian style, trapping every three stitches no matter what. It did even the tension out a bit but I was also hampered by using two yarns that weren't really the same gauge. The Matchmaker 4-Ply at 180 yards/50 grams is visibly thinner than the Baby Ull (180 yards/50 grams). So after sitting untouched for over a year I knocked them off in a few days. Fun!